The following applications are all implemented with [http://www.eclipse.org/gef3d/ GEF3D], demonstrating what you can do with this framework. The following applications are all implemented with [http://www.eclipse.org/gef3d/ GEF3D], demonstrating what you can do with this framework. If you have a project based on GEF3D, feel free to add a small description here. | GEF3D includes some example editors, such as 3D-fied versions of the Ecore Tools (ecore diagrams, see screenshot) and UML2 Tools (class, use case, and activity diagrams). Multiple diagrams can be visualized (and edited!) in a single 3D view. These editors can be used for you own 3D applications and demonstrate how to 3D-fy GMF based editors. 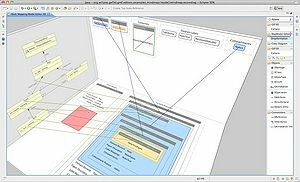 | GEF3D includes some example editors, such as 3D-fied versions of the Ecore Tools (ecore diagrams, see screenshot) and UML2 Tools (class, use case, and activity diagrams). Multiple diagrams can be visualized (and edited!) in a single 3D view. These editors can be used for you own 3D applications and demonstrate how to 3D-fy GMF based editors. [[GEF3D Run Examples]] describes how to set up and run these example editors. | The Eclipse Agent Modeling Platform provides tools for agent meta-modeling called AMF, agent execution called AXF and visualization called AGF, and has used GEF3D for AGF3D. 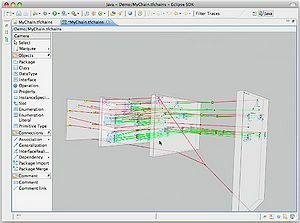 | A 3D visualizer of a transformation chain, each model is displayed on a plane, the transformation traces are shown as inter-model-connections. The models are displayed using a 3D-fied version of TOPCASED UML, an ER-diagram-editor is a simple GEF based editor. | TVT3D is a tool for visualizing and animating scenario-based walkthroughs in early states of software development (analysis, design). GEF3D is used for displaying activity diagrams, class diagrams and dependencies between them (intermodel connections). The activities specify use cases, the class diagrams contain the classes and operations, which realize the use cases. There are two types of intermodel connections: Action-operation and operation-operation (operation call). The following applications are all implemented with GEF3D, demonstrating what you can do with this framework. If you have a project based on GEF3D, feel free to add a small description here. 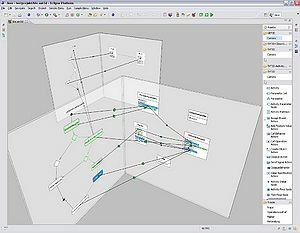 GEF3D includes some example editors, such as 3D-fied versions of the Ecore Tools (ecore diagrams, see screenshot) and UML2 Tools (class, use case, and activity diagrams). Multiple diagrams can be visualized (and edited!) in a single 3D view. These editors can be used for you own 3D applications and demonstrate how to 3D-fy GMF based editors. GEF3D Run Examples describes how to set up and run these example editors. 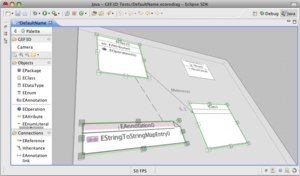 The Eclipse Agent Modeling Platform provides tools for agent meta-modeling called AMF, agent execution called AXF and visualization called AGF, and has used GEF3D for AGF3D. 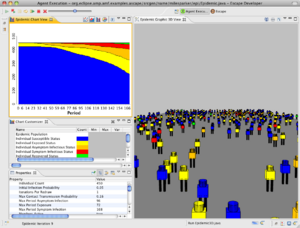 TVT3D is a tool for visualizing and animating scenario-based walkthroughs in early states of software development (analysis, design). GEF3D is used for displaying activity diagrams, class diagrams and dependencies between them (intermodel connections). The activities specify use cases, the class diagrams contain the classes and operations, which realize the use cases. There are two types of intermodel connections: Action-operation and operation-operation (operation call). This page was last modified 10:41, 4 October 2011 by Jens von Pilgrim. Based on work by Matthias Then, Miles Parker and Kristian Duske.